This year's Huddersfield Contemporary Music Festival (hcmf) runs from Friday 21 to Sunday 30 November 2014 in a action packed week-and-a-bit of events. The composer in residence this year is James Dillon and there are four concerts devoted entirely to his works, from the London Sinfonietta, BBC Singers, BBC Scottish Symphony Orchestra and the Arditti Quartet. In addition the Arditti String Quartet has its own 40th birthday celebration concert with a new work for them by Marco Stroppa. Other birthdays being celebrated include Christian Wolff at 80, and Evan Parker at 70. There are new works from Larry Goves, Alexander Schubert and Pedro Álvarez, whilst the renowned hcmf// shorts programme presents an entire day of free music on Monday 24 November, in a series of short free concerts which give you a varied and concentrated burst of something amazing. Other events include a performance of Salvatore Sciarrino's Lohengrin for singer and ensemble which was premiered in Bergen in 2013. 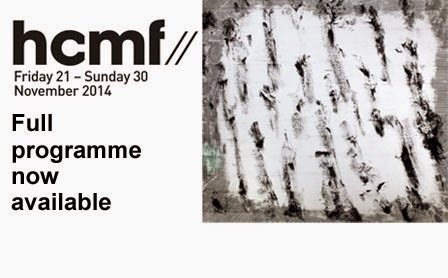 See the hcmf website for the full programme.